International investment in U.S. real estate is nothing new. Many South American businessmen and wealthy families own beachfront condos in Miami. Europeans from countries like France, Germany and Italy often choose to relocate to the United States. What is really making realtors in the United States stand-up and take notice is the rapidly growing interest in U.S. properties by Chinese investors. According to the National Association of Realtors, in the one year period from March 2013-March 2014, Chinese real estate investors and home buyers spent $22 billion dollars on real estate purchases in the United States. The data also shows that California was, by far, the favorite state for Chinese real estate purchases. Of the $22 billion spent between the first quarter of 2013 and the first quarter of 2014, 35 percent of that money was spent purchasing California real estate. Rounding out the top-5 market shares were Washington (9 percent), New York (7 percent), Pennsylvania (6 percent) and Texas (6 percent). As the standard of living has risen in China in recent years, Chinese visitation to the U.S. has increased dramatically. This year, it is expected that more than 2,000,000 Chinese tourists, students, and businessmen will pay a visit to the United States. While you do not actually have to visit the United States to invest in real estate in this country, most Chinese people who do decide to purchase a home in the U.S., have visited the States one or more times. While not everyone who visits America from China is wealthy, most who purchase homes pay cash as opposed to taking out mortgages. Yes, California is a beautiful state, but why does it attract nearly four-times more Chinese real estate dollars than Washington state? Los Angeles, San Francisco, and San Diego are among the most desirable cities for Chinese real estate investors. One thing that makes them particularly attractive is the presence of large Chinese communities. Many of the people who live in China have family or friends living in Southern California or the Bay Area. All of the above-mentioned cities depend heavily on tourism to help drive their local economies. Hotels, restaurants, and other members of the business community all make a concerted effort to please international travelers. 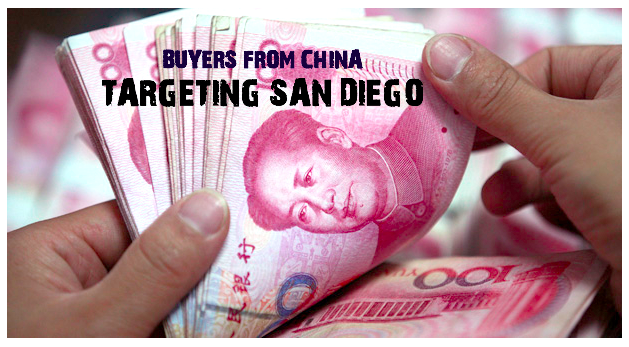 Chinese people feel welcome in San Diego, San Francisco and Los Angeles. In addition, California, as opposed to a states on the East coast, is much closer to home. It is easier to get a direct flight from Shanghai to Los Angeles. California also offers excellent colleges and universities such as Stanford, UCLA, and San Diego State. Chinese parents will often purchase a condo for their son or daughter who is attending one of the state’s universities. Finally, being the home of Silicon Valley is particularly attractive for technology-minded buyers who may be looking for careers in the United States. For many of the same reasons as California, Seattle, and the state of Washington attract home buyers from China. A good location, access to the latest technology, a major port, and a welcoming community are all incentives for moving to the Great Northwest. New York is the world’s financial capital, has more museums and fine restaurant, and is home to some of the most desirable real estate in the world. Wealthy Chinese investors and businessmen want and need a place that is close to the action. Detroit is unexpectedly attracting a certain breed of Chinese real estate investors. Some savvy Chinese investors are scooping up distressed properties at bargain prices, fixing them up, and renting them out. While there is definitely some speculation involved, investors are betting that the auto industry and the City of Detroit will someday return to its former glory days.